Gujarat University B.Ed 2nd Round Result 2018: Gujarat University has scheduled to release the B.Ed Second round seat allotment result today, 25th July. 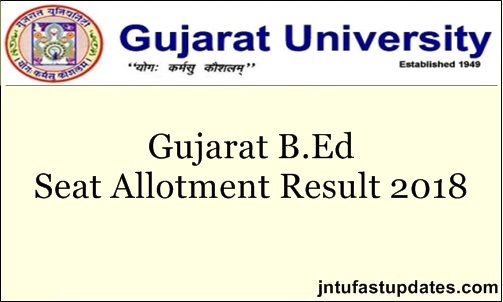 Candidates who have qualified in the Gujarat B.Ed examination and applied to get admission in B.Ed courses can go through the Gujarat B.Ed 2nd round seat allotment result from the official website, eform.gujaratuniversity.ac.in. candidates who got admission in 2nd round seat allotment will have to pay the requisite admission fee and report at the allotted colleges. Candidates who do not get the admission in 2nd round seat allotment will have to stay back for the Gujarat B.Ed final round seat allotment result. Aspirants seeking to get B.ed admission in the state of Gujarat can check more details from the official website. Gujarat University provides the admission for aspirants into Bachelors of Education (B.Ed) courses for the eligible aspirants. Candidates with suitable educational qualification applied every year for B.Ed admissions. Based on the merit of aspirants, the admission will be allotted to the students. Gujarat University has released the B.Ed provisional merit list on 8th July. And the university has come up with the Gujarat B.Ed final merit list on 12th July and mock seat allotment result on 13th July. Candidates who had checked the mock allotment result can check the Gujarat B.Ed seat allotment result 2018 [2nd round] from today. Check more details from the following article. On the homepage, check for the Gujarat B.Ed 2nd round seat allotment list link. Click on the link and enter the details of register number, password etc. Gujarat B.Ed seat allotment result will be displayed on the screen. Check the list and take a printout of the allotment order to report the allotted college.